Recently I received a few messages updating me about the progress the province of British Columbia has made with their DataBC project witch helps provide the public access to public funded data sets (http://www.data.gov.bc.ca/). I checked DataBC site out and was impressed with the great job that the BC folks have done with sharing their geographic tools and data that in turn should also help increase the use of geomatics in British Columbia. The DataBC program provides public access to provincial geographic information through a single web interface, offering a multitude of geographic data (spatial and non-spatial), applications and tools in order to help their citizens make better informed decisions, inspire change and encourage development of new ideas to improve government decision making & policies. Besides providing the Provincial Open Data initiative they also mange the Provincial SDI/Services Architecture among other things. They have provided minimal licensing requirements to their data to help broaden the use of the Province’s assets. “You can use our geographic services to help map the data and find tools to help you conduct your own research, analyze statistics, develop apps or to simply satisfy your curiosity.” Open data provides opportunities for the public geomatics community to help changing demands of society. “BC has rich and varied geography. From the rich farmland of the Fraser Valley to the deep forests of northern BC and Vancouver Island, no two places are alike. This diversity has made BC a geomatics leader in Canada. Since 2003, the Province of BC has provided a Spatial Data Infrastructure, centred on the BC Geographic Warehouse. This shared data store of geographic data greatly increases the availability and use of the Province’s wealth of geographic data. To support this work, we also provide web services, application frameworks and online applications to discover, view, download and analyze geospatial data. The Spatial Data Infrastructure encompasses all government sectors, providing hosting, transformation and delivery of data across government and to the public. Used extensively to support government decisions, these systems serve hundreds of thousands of users with 110 legislated and mandated line of business applications such as land tenure, transportation, public safety and emergency response systems. 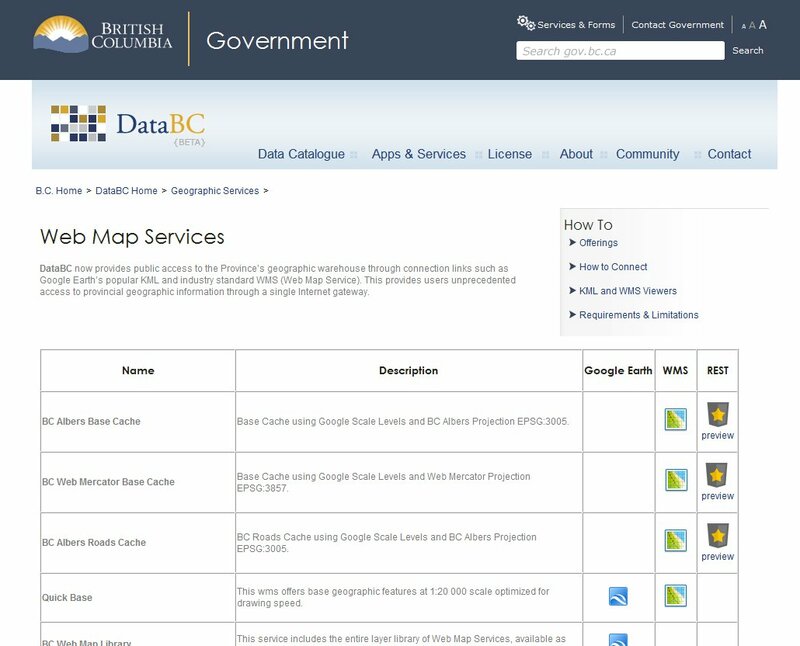 What type of Open data is available from British Columbia’s DataBC Catalogue? Administrative Boundaries – This web map service offers seamless, administrative boundary data for the province of British Columbia. Air and Climate – Data relating to patterns of wind, temperature, precipitation, etc., over a period of time, for a specified area. Geodetic Survey – Data relating to the geospatial reference used for positioning within the Province. Geology and Soils – Data relating to the structure and composition of the earth, its physical and organic history. Imagery – Orthophotography, hill shades and regional imagery covering various portions of British Columbia. Imagery – Spot 15m satellite imagery & Landsat imagery covering various portions of BC. Land Ownership and Status – Data relating to the ownership of land and the parcels into which the land has been subdivided. Mining and Petroleum – Data relating to the inventory, planning, management, and monitoring of the extraction and depletion of mineral, sand, gravel, coal and petroleum resources. Physical Infrastructure – Data about human-made physical structures, which support economic and social activities. e.g. : utilities, communication, transportation, buildings. Wildlife and Plant Species – Data relating to the inventory of wildlife, and/or plant species (including species at risk), and the quantity and quality of a species habitat. The “Start a project” feature on the site was kind of a neat, it helps to inspire or encourage people into generating their own applications, maps and research. The little interactive tool kind of coaches people that need some guidance or a little push to get their projects rolling. It shows how dedicated the team of the DataBC program are as they try to inspire more people to get involved and use what they have to offer. It is not just the general public and enthusiastic geomatics professionals that have been making use of the DataBC site. various other BC government programs and organizations have also been getting involved utilizing some of the data sets to provide on line mapping services to enhance their own web sites and services. Some examples are the Ministry of Justice that offers a “BC Court Finder” web map and BCParks that created the Things to Do & See in BC web map. 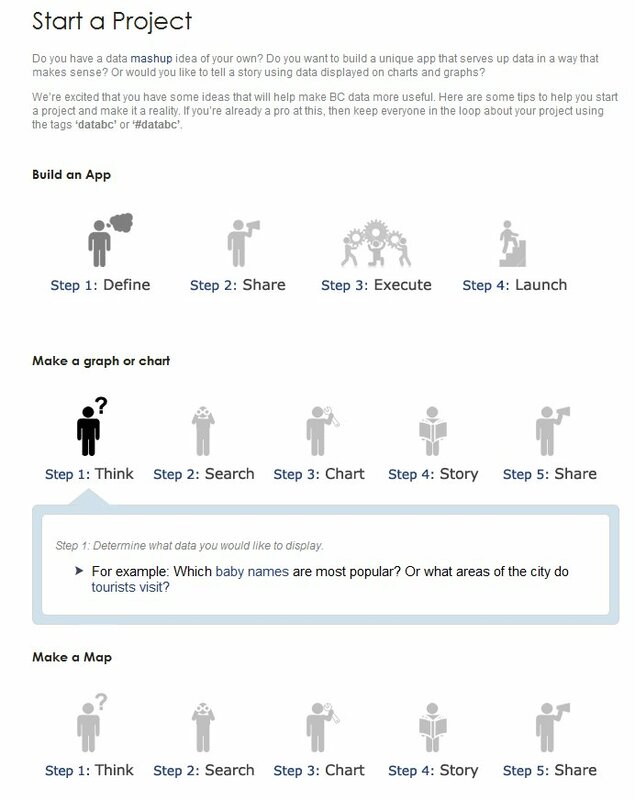 Check out what DataBC has to offer or download some British Columbia data sets and get started on your project. And if you can not find the data you are looking for and want more British Columbia data, then be sure to request the data as the site boasts that they are open to communication (through their web site & social media) and feedback and want to hear from those that get involved or have something to share. In order to continue providing good Open Data Sets they need people to let them know what matters most and what their citizens need access to. BC Provincial OG Licence: http://www.data.gov.bc.ca/dbc/admin/terms.page? Another page describing the other Geomatics related services available from DataBC will follow soon.